When the sill, posts, girts, plates, and braces are in place, the only step that remains to complete the rough framing of the wall is the filling in of this framework with studding. The studding is of two kinds, viz, the heavy pieces which form the frames for the door and window openings and the stops for the partitions; and the lighter pieces which are merely "filling-in" studs, and are known by that name, or as "intermediate" studding. Fig. 110. Light Braces for Balloon Frame. Fig. 111. Construction of Door and Window Frames. The frames for the door and window openings are usually made in a braced frame, from 4X 4-inch pieces. A vertical stud A A, Fig. 111, is placed on each side of the opening, the proper distance being left between them, and horizontal pieces BB are framed into them at a proper level to form the top and the bottom of the opening. In all good work a small truss is formed above each opening by setting up two pieces of studding CC over the opening, in the form of a triangle. This is to receive any weight which comes from the studding directly above the opening, and to carry it to either side of the opening where it is received by the studding and in this way carried down to the sill. Such a truss is shown in Fig. 111. The pieces used are 3X4 inches or 4X4 inches, and may be either framed into the other members or merely spiked. There should be a space D of at least 1 inch between the piece B forming the top of the window frame and the piece E forming the bottom of the truss, so that if the truss sags at all it will not affect the window frame. This is a point that is not generally recognized. The piece B is usually made to serve both as the top of the window and bottom of the truss. Fig. 112. Framing Details of Window Opening in Balloon Frame Building. Fig. 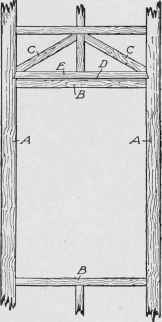 112 shows the framing for the top of a window opening in a balloon-framed building, where the ledger board is partly supported by the studs directly over the opening. 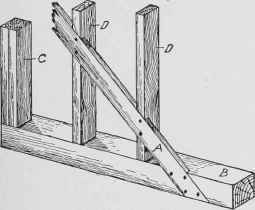 Since the floor joists rest on the ledger board, there may be considerable weight transferred to these studs; and in order to prevent the bottom of the truss from sagging under this weight, an iron rod should be inserted as shown. In the balloon frame, the door and window studs are almost always made of two 2 X 4-inch pieces placed close together, and in this case the connection of the piece forming the top and bottom of the frame with those forming the sides is made as shown at A in Fig. 113. It should be noticed that in a balloon frame all studding is carried clear up from the sill to the plate, so that if there is an opening in the wall of the first story, and no corresponding openings in those of the second or third story, the door and window studding must still be carried double, clear up to the plate, and material is thus wasted. In designing for balloon frames, therefore, it is well to take care that the window openings in the second story come directly above those in the first story wherever this is possible. 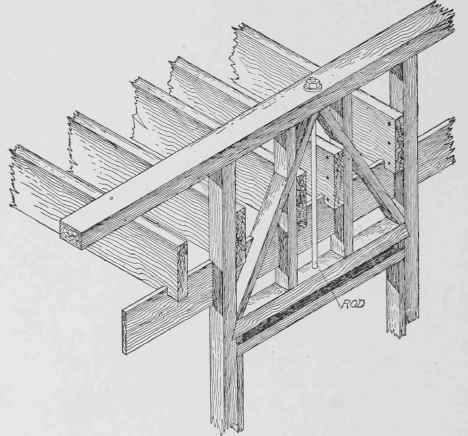 The same difficulty does not occur in the case of a braced frame, because in such a frame the studding in each story is independent of that in the story above or below it; the window openings may, therefore, be arranged independently in the different stories according to the requirements of the design.